INTI International University & Colleges recently hosted an interactive networking session with GE’s Top talents across ASEAN. General Electric International Inc (GE) is one of the world’s most admired companies with global presence in more than 170 countries including Malaysia. Top talents are selected by GE to be part of RISE program, a corporate run leadership development programme targeting high performing, and emerging leaders across GE with senior professional track aspirations. 30 GE ASEAN leaders from its diverse business sectors, namely health care, oil & gas, aviation, appliances & lighting, and power & water interacted with 50 engineering, business and IT students from INTI’s Subang, Nilai and Kuala Lumpur campuses. 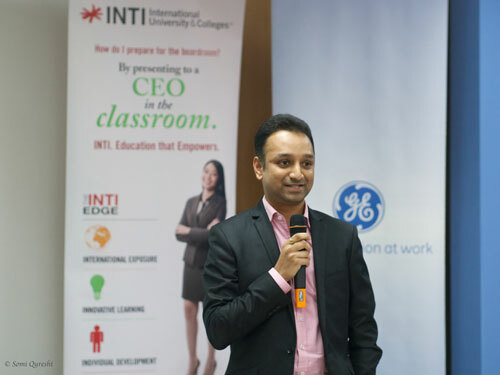 The session at INTI provided a platform for students to network with GE leaders and learn about exciting global career opportunities. The leaders, in turn, were appreciative of the occasion to share their expertise and experiences in an informal yet enlivening setting. “We are in the business of building big things; your career could be one of them. For graduates seeking a dynamic career doing meaningful work, GE offers extraordinary resources for growth and development within a collaborative culture of innovation that generates a massive global impact. Imagine answering the question ‘so what do you do?’ by saying that you were part of a team that saves 3,000 lives a day, or launches an aircraft every two seconds, or provides more than 100 countries with cleaner and more efficient ways to power themselves. What if you were part of a team that did it all? We hope to help young talents to discover what it takes to work for a global company like GE and inspire them to build their future,” said Vignesh Baboo, University Relations & Programs Leader – ASEAN, GE Global Growth & Operations. “Learning does not only happen inside the classroom. An event like this with GE -one of the world’s most respected and admired organisations – is a great way for our students to learn from experts in different business sectors. This is also a good opportunity for students to demonstrate and talk about the skill sets we are helping them to develop. Besides the functional skill sets related to their areas of study we want our students to develop 21st century skills that all employers look for, which are creativity, communication, critical thinking and collaboration,” said Rohit Sharma, Chief Executive Officer, INTI International University & Colleges. Over the last four years, INTI has collaborated with over 200 multinational and Malaysian companies on initiatives that include over 300 innovative employer projects, where teams of students resolve real industry problems for employers such as IBM, Microsoft, Dell and Motorola Solutions, and develop critical employability and soft skills in the process. To bring out a student’s full potential, individual development is also emphasised at INTI and this involves the student’s journey of transformation to become a competent graduate via a self-discovery and development plan using personality assessment tools, industry-run workshops and forums, and career camps.